I’ve spent a lot of time in 2011 playing games, but not a lot of time writing about them. Instead of my usual end-of-year game recommendations, I’d like to tell some stories or share some thoughts about the ones that meant the most to me this year. I’ll be posting one a day until Christmas. See all Games 2011 posts. One of the great gaming stories over the last few years has been the rise of Mojang’s extraordinary world builder Minecraft. The game has exploded in popularity, bringing with it a form of creativity and community that most commercial titles would be proud to have. Without question, Minecraft should be tried by everyone who has an interest in what gaming can do, as it’s a landmark experience. But Minecraft lovers should also experience Re-Logic’s Terraria, as it is a better game. Both take place in a randomly generated world with multiple zones or biomes. Both allow the player to destroy blocks of terrain using crafted tools, and use those blocks to either rebuild structures or craft new objects. Elaborate structures can be built. Both have day/night cycles, with friendly creatures inhabiting the world during the day and hostile enemies putting the player under siege after dark. Both games can be played solo or with friends. The differences become apparent as players begin to literally dig into the world. Minecraft has always featured a somewhat cryptic crafting system; placing materials into a 3×3 grid in the right pattern creates new objects. While this eventually becomes intuitive, there’s little chance you will figure this out solely from the game – I have to keep the Minecraft wiki Crafting page open in the background. After you get the hang of crafting in Minecraft and build your first pick, you’ll quickly realize that the tool has finite uses. And so you will generally explore Minecraft’s natural caves and underground rivers in the hopes of finding resources to rebuild your existing tools, or make them better if you can. This endless cycle of equipment management is not particularly fun, especially when you are forced to trudge back to your base after your last pickaxe breaks as you cannot press on. Terraria’s designers opted to not include a wear-and-tear system for equipment, which allows you to focus on spelunking to find new items, rather than carrying a stack of shovels. Underground, you’ll still find resources for building better tools, but also a range of breakable pots, treasure chests, and strange areas to grow your inventory with. When it comes to combat and fending off enemies, the games feel on different planes. Terraria offers players a huge array of weapons and tools, allowing different combat strategies and styles. Minecraft’s combat tends to come down to swinging a tool, firing a bow, or setting up an elaborate pre-meditated trap. Terraria has featured NPCs that run stores, provide services, and inhabit your world since the first release; Minecraft recently added humanoid NPCs but they are currently passive. Terraria launched with three boss monsters, and now features seven bosses and two mini-bosses. Minecraft recently added a first boss monster. Terraria has allowed players to increase their life and magic capacities through exploration since the very beginning. Minecraft added an experience system a few updates ago, but leveling up currently gives the player no advantages. 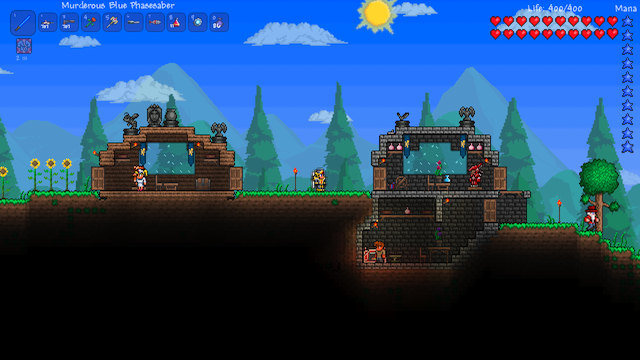 Terraria’s environments vary the risks and the rewards as a player finds new ones. Minecraft’s biomes mostly just change the view and materials present. I’m not pointing out these differences to imply Minecraft’s design decisions are flawed. They are not flawed, merely different. I purchased Minecraft while in alpha status in 2010, and I have happily followed the development and eagerly dug back in when the major updates come out. With two friends, we have constructed giant sand pyramids, obsidian monoliths, scale-model football fields, and elaborate castles hidden in the sides of mountains. When Terraria was released, I begged those same two friends to join me. At first, there was little difference in our approach to the new game – our base complex was built elaborately, our “hellevators” dug quickly, and excursions taken to find the major areas. But soon we were beating down bosses, raiding treasure chests, sharing loot, and defending our base from goblin invasions and blood moons. And that’s a more lasting memory than painstakingly laying out blocks and digging out caverns. My rule of thumb: if I want to build a new world, I launch Minecraft. But if I want to play in one, I fire up Terraria. Terraria is available for the PC. Jealous Mac users should know the game runs flawlessly under VMWare Fusion.